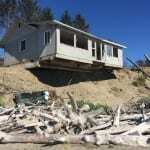 This will probably be the next in a long series of homes to fall into the sea at Washaway Beach, Washington. Photo by Tom Banse. 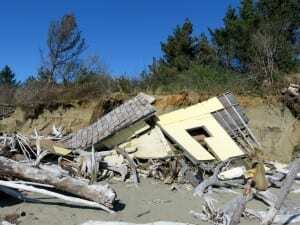 The Washington State Department of Ecology says the fastest erosion on the West Coast is happening at aptly named Washaway Beach. That’s located between the southwest Washington towns of Grayland and Tokeland. Coastal erosion threatens not just homes and a vital highway, but now the multi-million dollar cranberry industry too. Most places threatened by erosion try to fight back. As correspondent Tom Banse reports, the erosion at Washaway Beach is so rapid, to retreat or fight is in question. 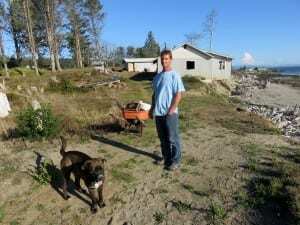 Homeowner Tom Burchard – with his dog Bo – has an air of resignation about soon losing the waterfront property that he said he picked up cheap. Photo by Tom Banse. People have tied together driftwood and stumps as a makeshift defense to armor the base of the low bank. Photo by Tom Banse. 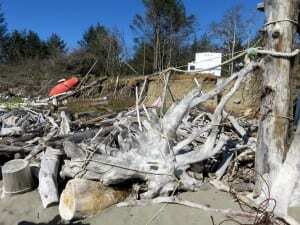 Wreckage of previous erosion victims litters the beach. Photo by Tom Banse. 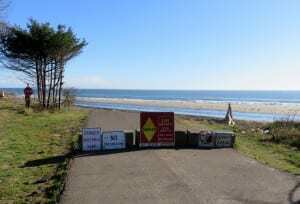 Neighborhood lanes terminate in thin air at Washaway Beach. Photo by Tom Banse. Cranberry growers David Cottrell and Connie Allen want to see more action to defend the valuable cranberry bogs between Grayland and North Cove. Photo by Tom Banse. Washaway Beach shoreline in 1990, from Google Maps. Washaway Beach aerial view in 2011, from Google Maps. Red line marks shoreline in 1990. First the ocean took a clam cannery. Then a lighthouse, a Coast Guard station and homes slipped into the waves. Then the ocean washed away the cove that gave the community of North Cove its name. The coastal erosion at this spot: unstoppable for decades. The school succumbed. Then the Grange hall, a post office and more and more homes. 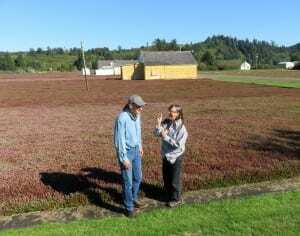 Now cranberry grower David Cottrell worries about his bogs. They begin slightly more than half a mile from the present shoreline. Saltwater would kill the fresh water-dependent cranberries. The Grayland, Washington area has long been one of the centers of cranberry production in the Northwest. Third generation grower Cottrell says Native Americans harvested wild cranberries around here long before white settlers arrived. The rerouted state highway SR 105 serves as a dike and the last line of defense for the low-lying cranberry bogs. There’s a thin strip of land dotted with homes on the other side. That’s shrinking as the tidal channel at the entrance to Willapa Bay migrates north and cuts into it. Winter storms combined with tidal forces chew off an average of 100 to 200 feet per year. 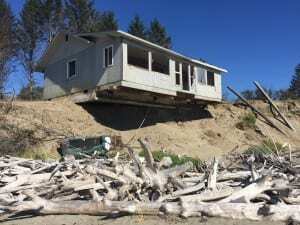 Retiree Jim Northup has calculated how long before the rapid erosion reaches his place, a block and a half removed from where other homes now teeter on the brink. Pacific County Commissioner Lisa Ayers has observed reactions like that and more, everything from hopelessness and doom to people full of fight. Ayers voiced determination to take on Mother Nature after listening to a new assessment from a consultant hired by the county. The coastal engineer reported the tidal channel is now holding steady just inland from Washaway Beach. The Washington State Department of Transportation is drawing up plans to reinforce the sole highway along this stretch of coast with more armor rock. 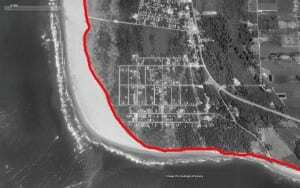 A sand berm out in the bay paid for by the U.S. Army Corps of Engineers to protect the Shoalwater Bay Indian Reservation is holding up. Still, tribal leaders have resolved to move uphill over the long term. Unlike people and homes though, cranberry bogs can’t be moved.